As I mentioned, my boyfriend and I had a great time in Reno. First, the Grand Sierra Resort, is a great place to take a vacation with your dog. Not only did they allow the dog to stay in the room, they gave us a plastic dog bowl for us to keep and a baggie full of treats for Teabiscuit. Teabiscuit was allowed eat with us at the sushi bar in the hotel restaurant, where he got a lot of loving attention from the hotel staff. Teabiscuit was, amazingly, also allowed to gamble with us on the casino floor. If it weren't for the casino's security concerns about folks snapping pictures or videos of the casino floor, I'd post pictures of Teabiscuit playing the Fireball slot machines. 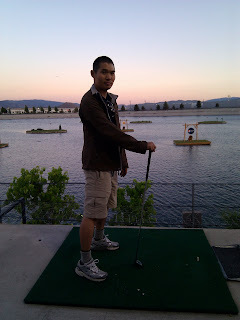 Right behind the Grand Sierra Resort, there is a driving range where you hit golf balls into a cement water reservoir. There are little islands in the reservoir that serve as targets. Depending on the one that you hit, you can win prizes like a dinner at Johnny Rockets or a trip for two to Hawaii. On my fourth or fifth ball I sunk in a ball that won me a 1 liter bottle of Pepsi. Considering I hadn't swung a golf club since my worst outing ever about 15 years ago, I was pretty happy with myself. As my boyfriend can attest, I was insufferably smug for the rest of the day. My boyfriend and I also discovered that my boyfriend's favorite hole-in-the-wall pizza place in Brooklyn has franchise restaurants in Reno. We noshed on some first rate pizza.